Confusion and misdirection for Apple's 2017 iPhone lineup continues to persist, with the latest claimed leak dubiously suggesting an "influx" of iPhone units with rear Touch ID sensors have been shipping. But there is plenty of reason to be skeptical about the latest claims. Parts leaker Benjamin Geskin shared the details on Twitter on Wednesday, but even he showed skepticism toward the latest details. 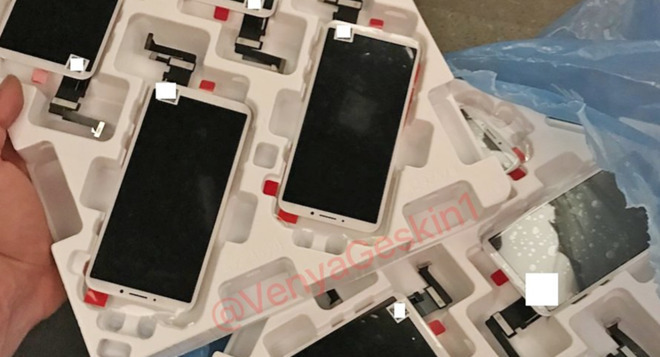 The image shows a pallet of smartphone front panels, featuring slimmer but not edge-to-edge bezels. A note accompanying the image claims to be from a shipping company employee who allegedly does safety inspections on batteries. The person says they opened the box in question during a customs and safety inspection, and that the units were en route to Apple. "Lately we've seen a huge influx of the iPhones with the Touch ID on the back, probably a few pallets per day," they wrote. 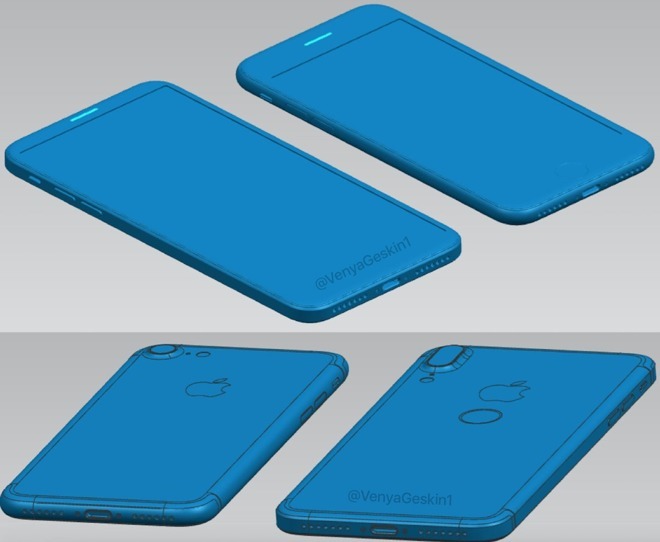 Geskin suggsted on Twitter that he does not believe the handsets pictured will be Apple's "iPhone 8." Instead, he tweeted a mockup of what he believes will be this fall's flagship "iPhone 8," featuring a truly edge-to-edge display. "I hate getting these," Geskin wrote of the latest alleged leak. "But I think it's interesting for you to see." Various leaks over the last few months have suggested that Apple could move the Touch ID fingerprint sensor to the back of the device on this year's iPhones. Doing so would allow for a larger display, but could also affect the convenience and ease of use of the current Touch ID home button implementation. Schematics, mockups and leaked parts have suggested the new Touch ID location could be located underneath the Apple logo on the back of the handset. But because the images simply show a home button-like circle on the back, it's also possible that the design element could be something other than a Touch ID sensor, such as a contact point for inductive charging. 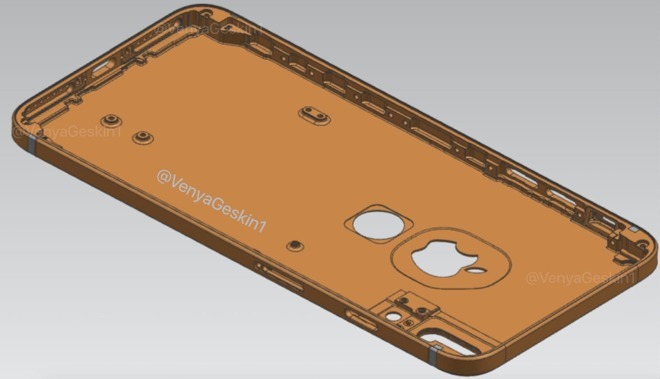 Responding to Wednesday's latest details, some on Twitter wondered if the leaks showing Touch ID on the back of the device could be for a so-called "iPhone 7s" model. It is believed that Apple will introduce three new iPhones this year: A flagship "iPhone 8" with an edge-to-edge OLED display, and an "iPhone 7s" lineup in sizes of 4.7 and 5.5 inches that will look largely the same as the iPhone 7 series. No rumors thus far have suggested the "iPhone 7s" models will see major changes from the iPhone 7 and prior, which casts some doubt on the prospect of moving Touch ID to the back of the device. Matters are even more murky with the "iPhone 8" after a pair of reports from earlier this week suggested Apple may ditch Touch ID entirely in favor of facial recognition. Using advanced cameras, Apple is said to be looking to replace the fingerprint sensing biometrics currently found on iPhones with a system that could identify a user's face, even when the phone is laying down on a table. Apple's trio of new iPhones are expected to be announced in September, launching to customers this fall.